I am doing some colour testing for Lauscha. Here we’ve got a new batch of SNT 150 orange transparent vs the 13/02/12 batch (*cough* which I have for sale on Lauscha.co.uk *cough*). 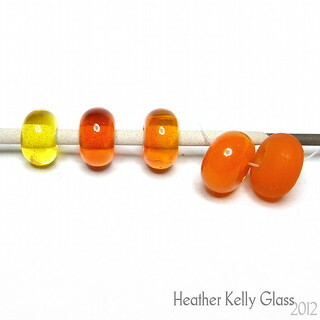 The new 08/12 orange is darker and transparent in the rod (not that you can see that in the photo – it is, though! ), whereas the 13/02/12 batch is a sunnier orange, translucent and ringed. Here’s a photo showing everything from both batches. I made three spacers from the 08/12 orange – I’ve left them on the mandrel so you can see that this version is more sensitive to striking. They have stayed transparent, unlike the 13/02/12 spacers. The yellow spacer was the last one made and is unstruck. 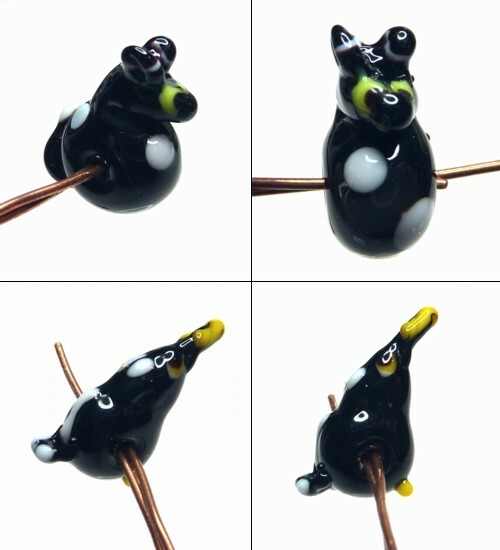 The centre bead received most heating and cooling, and is the darkest. With the 13/02/12 batch, you can see the spacers are not transparent (one is etched). You can see a little way into the surface but not all the way through. I went on to make hollow pumpkins from both oranges. Quite a lot of heating and cooling goes on here: the 08/12 batch has struck deeply and quite uniformly. If you hold it up to the light, you can vaguely see inside, but only just. It stayed transparent just next to the holes, but not further out. The 13/02/12 batch is streakier and has transparent streaks you can see into. It also has a rather nice effect where it is yellower in the grooves and blushes oranger on the face of each segment. The 08/12 batch is more like CiM clockwork in colour, though does not go misty like that can. Edit: Here are a couple of gremlins I made. I’ve shown the backs too so you can see that the 08/12 batch has some transparency left here – you can see the mandrel line. Note: the lips and eyelids are an egg yolk-coloured batch of Effetre opaque dark yellow. I used that instead to avoid having any white show through them. On the 13/02/12 gremlin, the lips aren’t the same colour as the body, but my camera isn’t picking that up. (These oranges are tricky to photograph correctly in the first place, because they’re so bright the camera just completely over-saturates them and I have to fiddle about with my colour balance to get them looking as they do). CiM phoenix was the Colour of the Month for September. The rods are a reddish coral colour that go pale when they first get hot, then strike back through yellow-orange to red again. I was trying to keep more of the colour variation without much luck (and I couldn’t get it hot enough to reset the strike on my hot head). The first has silver leaf on the surface and was reduced. The second is a plain round and has more of the lighter colours in it. The third has raised trails – I was hoping for more different colours but didn’t keep them. This cylinder has a little more – I stopped before shaping it any further. This last photo was a slight accident – I was taking it in daylight to get better colour and got shadows from the blinds. For a week in the middle here, I ran out of gas *horror*. I can only replace my bottle on weekends, and it ran out on a Sunday night after the place I get it from had closed. Very frustrating! The colour of the month challenge for July was CiM Zachary, and the theme was On the Beach! I made some twisties featuring white, CiM ginger and stoneground, dark red brown and coral. Then I made a set of a dark red brown lentil and matching spacers decorated with the twistie and some layered dots of the colours in it. I did a similar thing with CiM zachary, dirty martini, electric avenue and Vetro med lapis. I call this lot ‘Tide coming in’. They’re variable – I didn’t manage to keep my lentils the same size, and I got them too hot while adding the murrini so they went out of shape a bit. They are mostly dark ivory, Reichenbach ocean and murrini by me, Kaz and Jolene. The lentils also have some SIS shards, some CiM stoneground and some P&T vanilla. I noticed on the rounds that if I left the wraps of ocean thin, they tend to react and go brown round the edges, but are fine when thick. These are white encased in ocean with Kaz’ broken biskwits murrini. 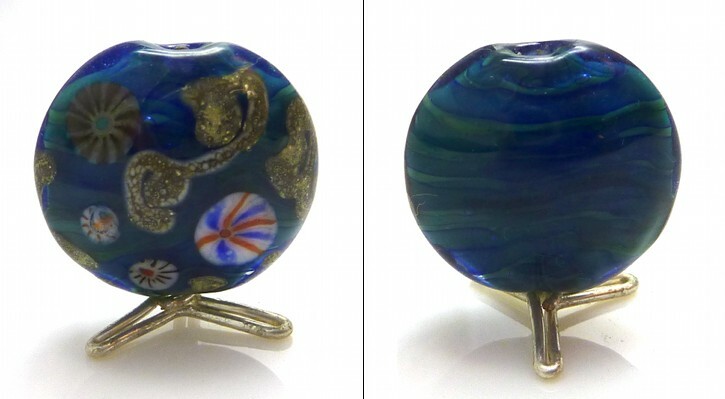 I love Reichenbach ocean – it has little glimmers in it. This is CiM sapphire and mermaid with SIS shards and Kaz broken biskwit murrini. More dragonscales – magic and petrol green dots. 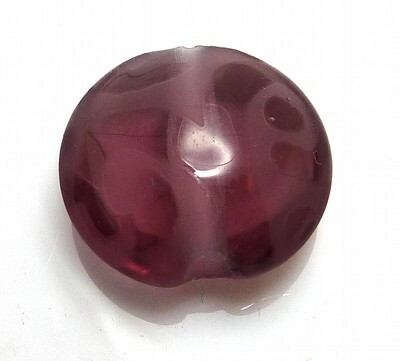 This is a part-etched amethyst lentil. I used nail polish to draw the design on it before putting it in the etching fluid. CiM sherwood encased in ocean with biskwit murrini and trails of SIS on one side. Unfortunately this one thermal shocked. The picture shows the back too – the glitter in the ocean gives a subtle shimmer over the green. I don’t think the red, blue and white murrini goes very well with it, but that’s the danger of choosing one at random! I don’t like the way I decorated the front in general – it’s rather bitty. A little jelly-like kitty in CiM pulsar. 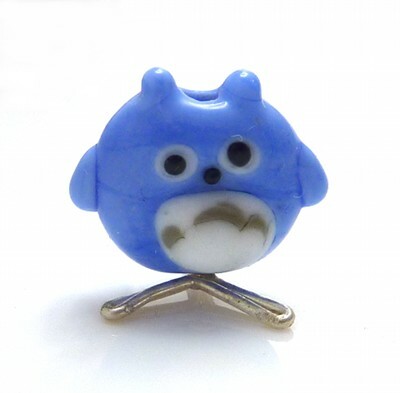 It has kryptonite eyes and a blue Kaz biskwit murrini front and back. 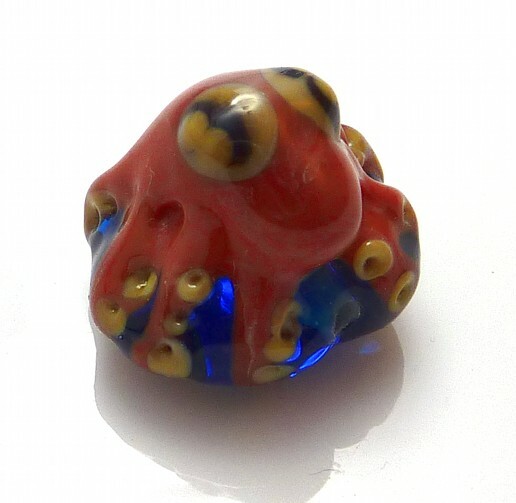 An octopus! Base lentil is pulsar, body is CiM phoenix with stoneground. 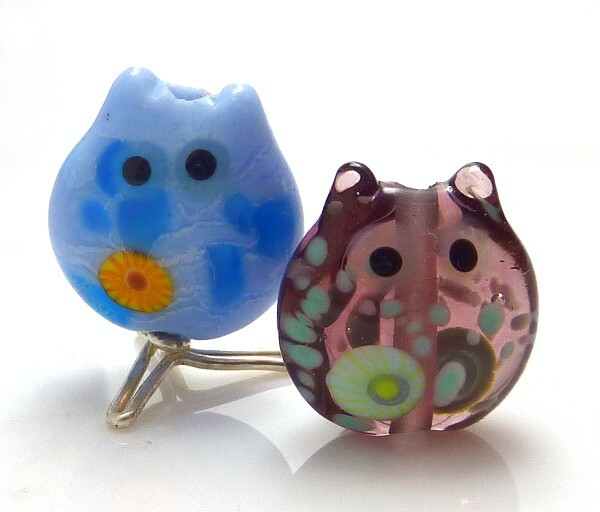 These kitties are in CiM zachary with pulsar dots and amethyst. Again, Kaz biskwit murrini front and back. I redid the cracked ocean and sherwood bead, but used Kaz’s multicolour mermaid murrini this time, and kept the decoration down. I like this one much better. I made some more using these colours: 2 rounds to go with the lentil, and my first BHB. Making the big hole bead smooth and symmetrical is definitely on the tricky side! 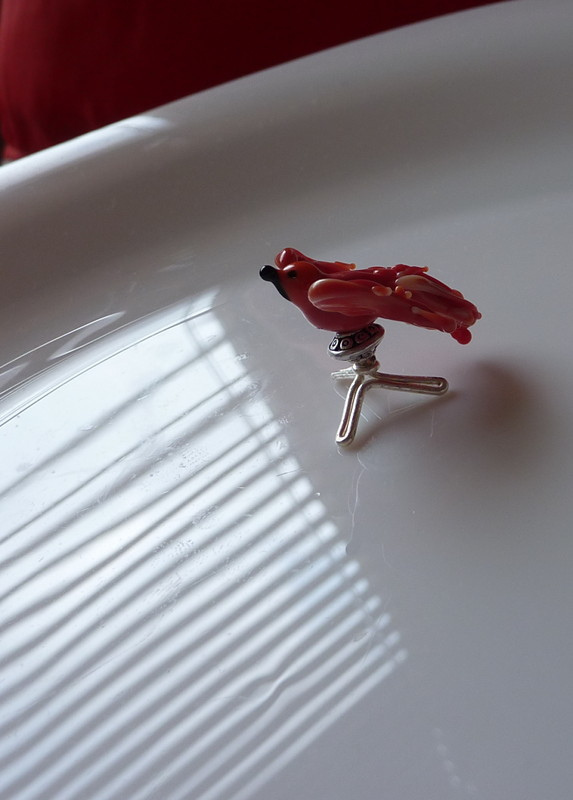 This was on a 5mm mandrel. 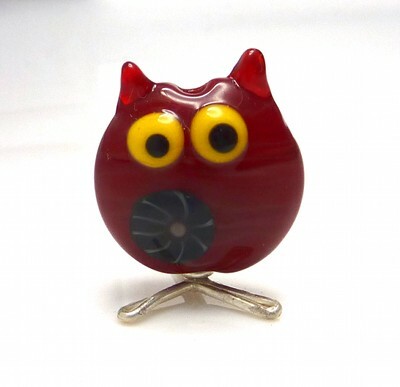 Kitty in CiM sangre with Vetro odd custard eyes and Kaz biskwit murrini. The custard was a bit brighter than I was expecting! He peeeeers at you. 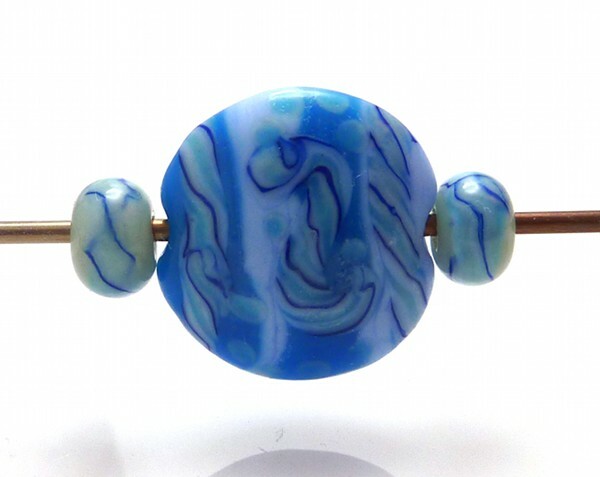 Ivory and dark turquoise beads – lentil with raked dots, 4 rounds with raked dots, 4 plain spacers. 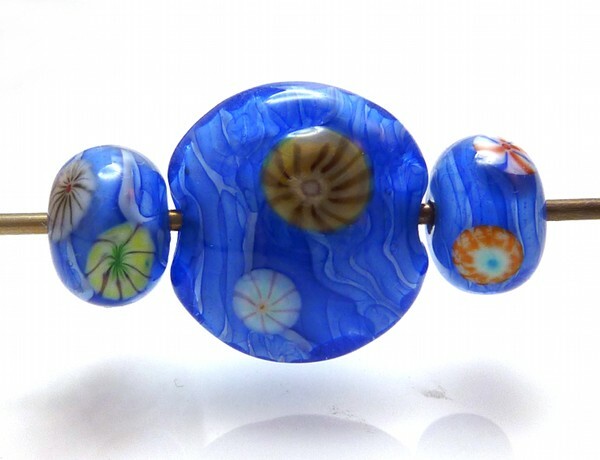 The beads were etched. 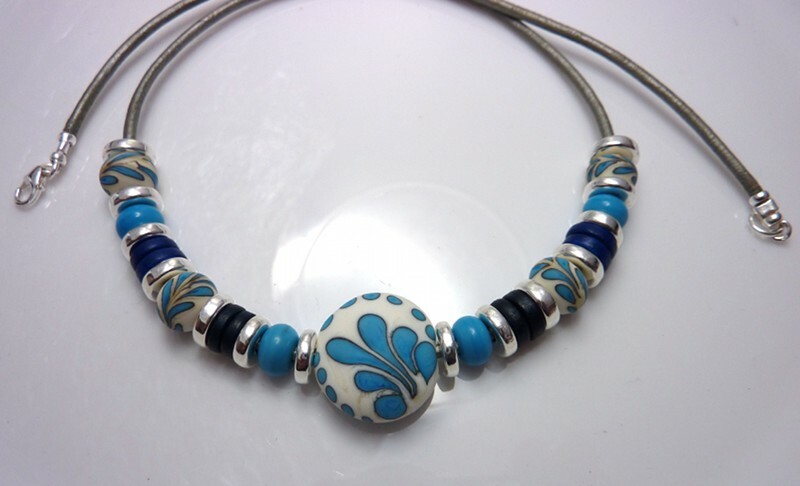 Combined with Greek ceramic beads in blues and fine silver, strung on silver leather with a sterling clasp. I just sat down and made all the beads for this without having much clue what I was going to make beforehand. I’ve done the raked design once before and quite like it, and I’m very pleased how the necklace turned out! 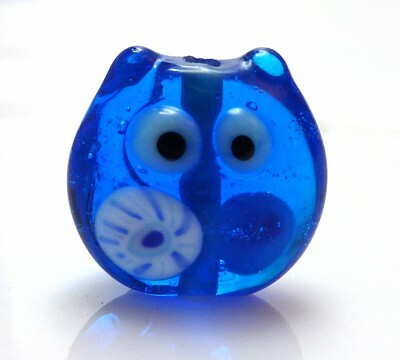 Totoro bead in Vetrofond periwinkle, 4 gravity swirled rounds, 4 periwinkle spacers. 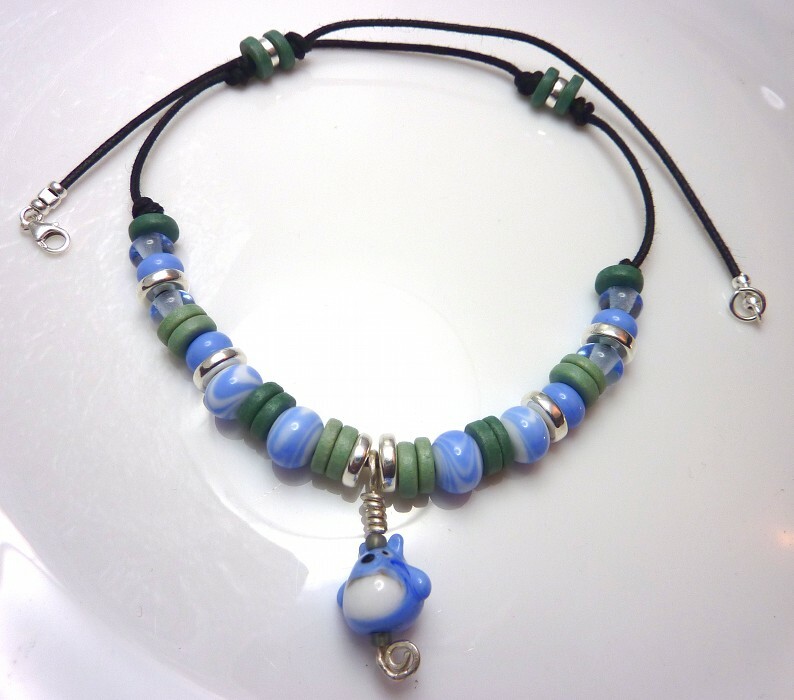 Combined with Greek ceramic beads in greens and fine silver, strung on knotted waxed cotton cord with a sterling clasp. 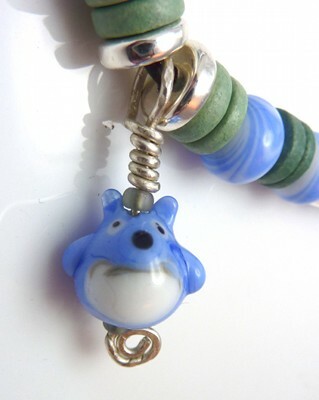 This was my first try at the Totoro necklace. 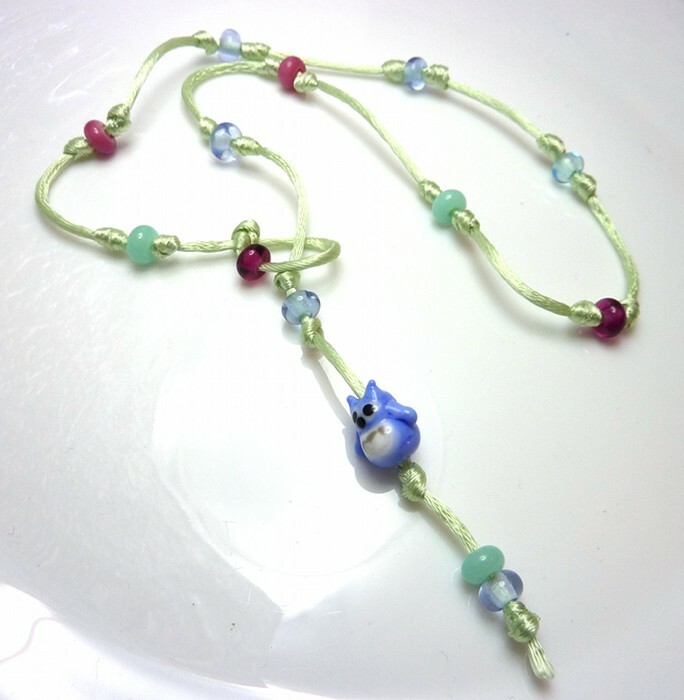 It’s lariat-style on green silk rattail with small spacers in pale blue, kryptonite, pink lady, mystic pink, dark lavender and baby blue. 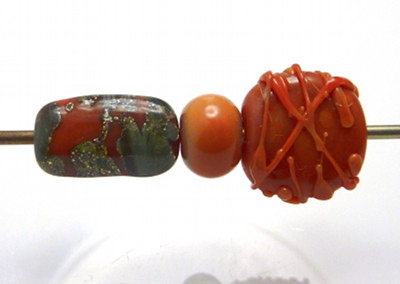 I decided it didn’t work very well – I think it needed larger beads as it looks very thin and sparse in person. The dragonscale beads were also done in week 17. 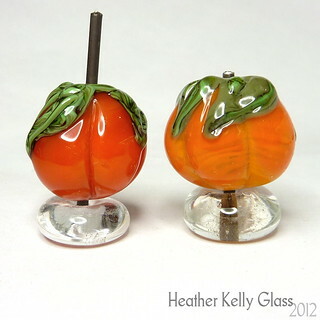 Hummingbirds. I did these after Sabine mentioned Roger Child’s hummingbird tutorial on YouTube. I made the hole going the wrong way by accident the first time… This is something that I had to force myself not to do for the other ones. It just felt more natural for the body to be that way round! They are petrol green with dark lavender wings, which has photographed as blue under my halogen bulb (dark lavender’s a colour shift glass). Some more. 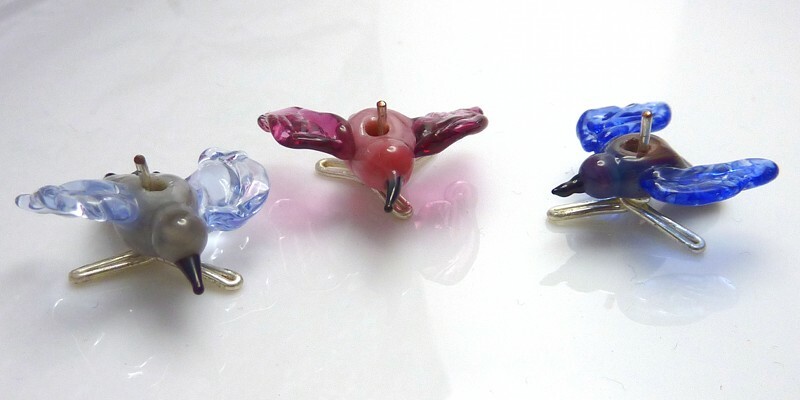 One has a Reichenbach mystic grey-blue body and pale blue wings, another is mystic pink with pink lady wings, and the third is MCD with ocean wings. 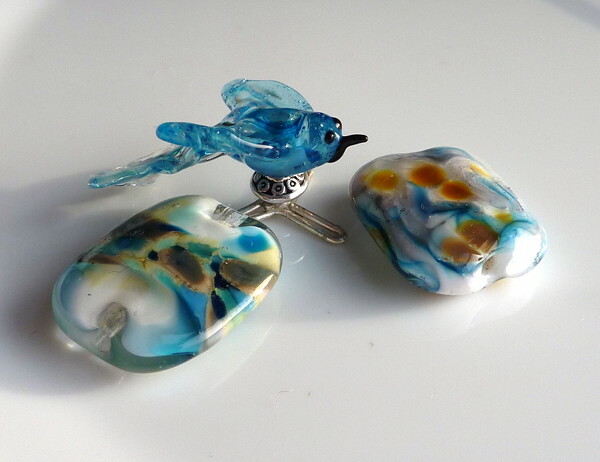 These are Reichenbach iris blue on ivory. See how the design on the lentil has nowhere near as much of a reaction line? I think this has a lot to do with pressing and only the surface of the glass being heated up as much after I added the blue. It wasn’t hot enough to sink in so much, so it didn’t produce as much of a line. The rounds were heated fully molten while I melted the dots in and gravity swirled them a very little. They’re reduced to get the metallic effect. On the right are lace beads, made by making a base of anise white, adding little bits of CiM Hades stringer and superheating it so it webs. Love the effect. 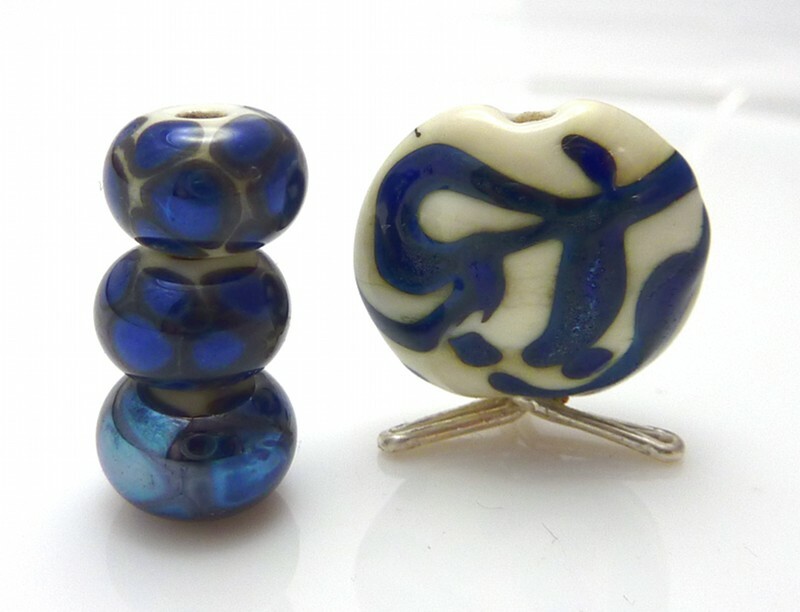 On the left are yellow opalino beads. The bicone has robin’s egg blue frit on it. The rounds developed that reddish colour in the kiln, which confused me a lot! I am assuming they reduced slightly in there, but only on one side. I have christened these “Wut? !” beads. They are fugly. They’re dragonscale-based. The first is an ivory base, SIS dots, then Reichenbach silver brown dots that were melted in, reduced and dots of clear were added on top that were then partly flattened. The second is similar but has a CiM olive base, SIS dots and EDP striped pink dots before doing the silver brown and clear as above. Lots of devit from the striped pink and a big blobby mess! Mystic pink hollow with purpur frit. Mystic pink lentil with hades webbing: this behaved slightly oddly, didn’t web well and formed some whitish lines as well. Devit? Then a dark lavender lentil with hades webbing (I adjusted the photo so it appears the normal colour rather than blue). 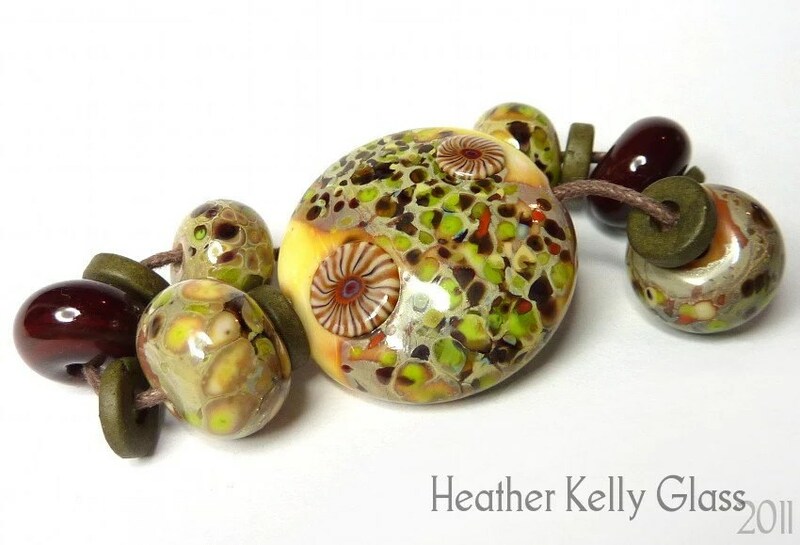 In week 18 I also made beads for birthday necklaces for two of my friends – to be seen in my next post! 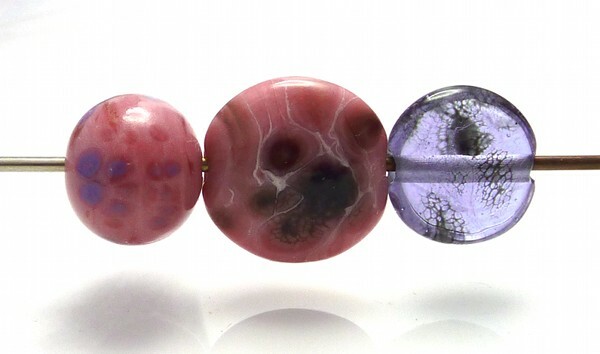 Plus a number of tiny little spacers in pinks, blues, and greens. 1. 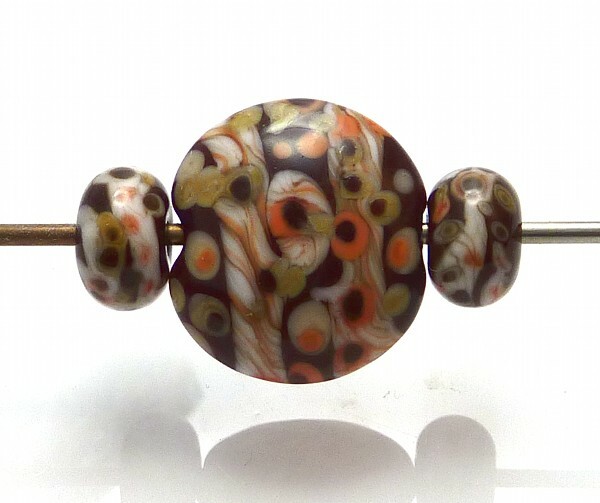 Dots – dark grey opaque base with dark chocolate brown, ivory and coral dots. 2-3. Cat and penguin, see below. 4. Ivory mashed bead with random raked coral. 5-6. 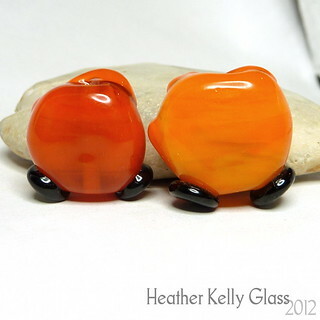 Coral spacers. One heated up more times than the other. 7-10. Iris gold frit on white, black and twice on dark ivory. 11. Bicone attempt. 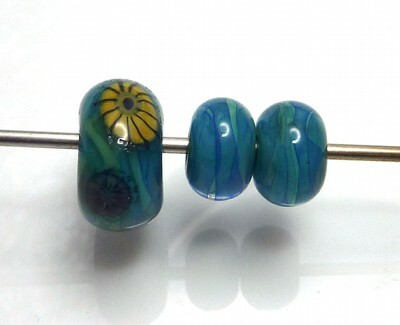 Dark ivory with dark turquoise ends, dots and stripes. More critters! The cat ended up with a bit of a mouse face… I’m pleased with the penguin, though I’ve realised that if I make them with the bead hole running that way, if I want to make them into jewellery, I’ll have to thread them on something that won’t let them turn easily or they’ll hang upside down. 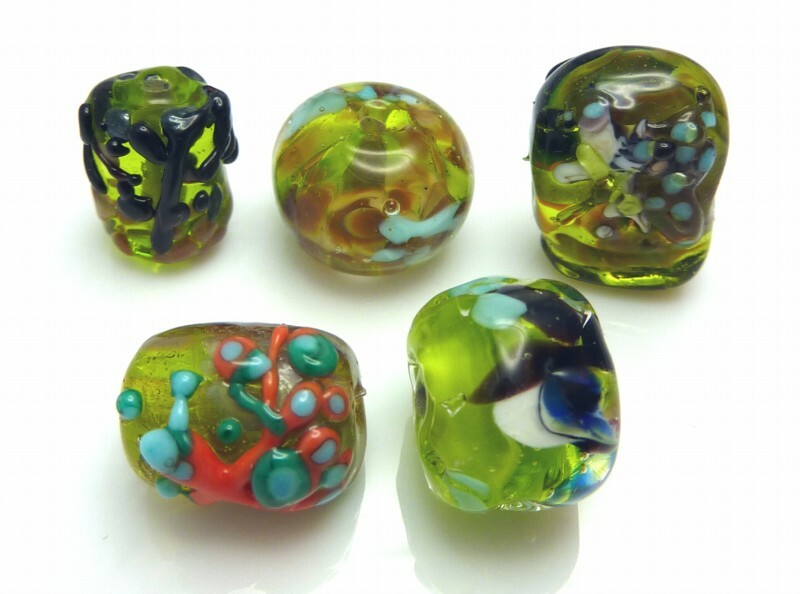 Fairy beads – these were for the (extended) February Newbie Challenge on Frit-Happens! 1. Tree. 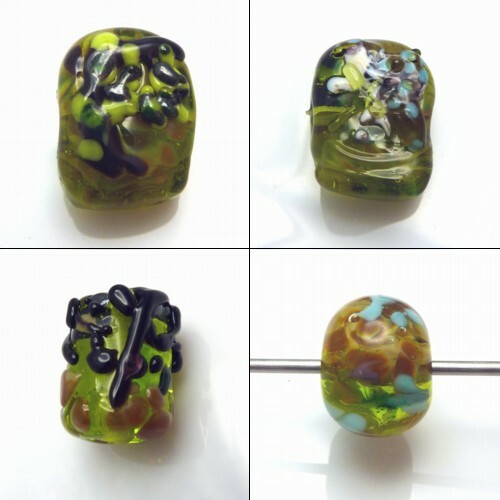 A grass green trans cylinder base with iris opal yellow frit on the bottom and green aventurine frit on top, then the tree done in black stringer. The green aventurine doesn’t show up very much as it’s rather dark. 3. Oblong tree with fairy. Grass green trans and iris gold frit again, encased in more grass green and mashed into an oblong. Tree on one side – black stringer, lime green stringer and aventurine green frit for leaves. Added a bit too much so it went all blobby. Fairy on the other side – dark ivory and turquoise and some trans mid purple that doesn’t show. There was more decoration at the top so I had to add extra green glass to the bottom to even out the thickness a bit. 4. Large cylinder with bug-fairy. 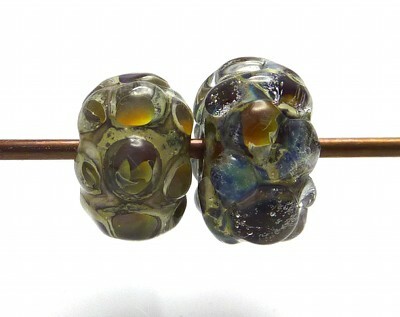 Grass green trans and iris gold frit again, encased in clear with a little more iris gold on top. 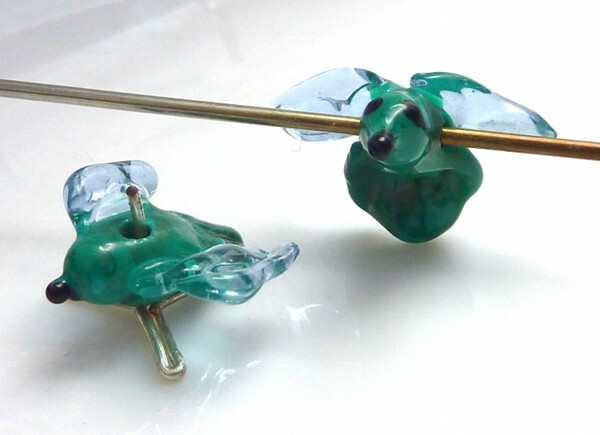 The fairy shape is in coral with petrol green and turquoise dots. The coral was probably a bad idea – it looks dull grey-purple when hot, so I ended up using too much of it without realising quite how bright it would end up. 5. Eye! Lime green opaque core, encased in grass green trans. 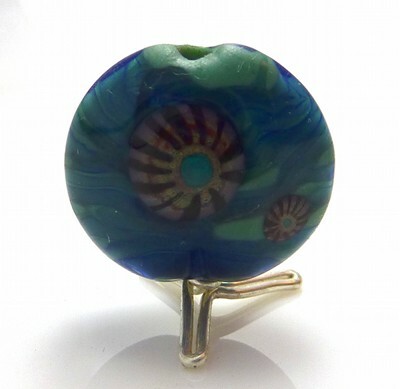 The eye is two dark ivory dots with a black one in the centre, then a small ring of ivory over the black for the iris. The iris has cobalt blue and grass green dots. Black stringer around top, going to a small squiggle. 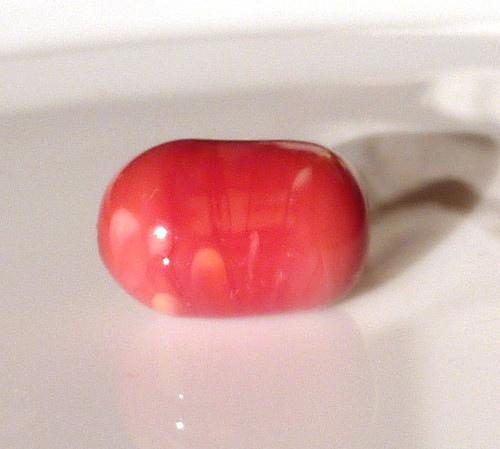 Corner of the eye is light pink with striking red on top. 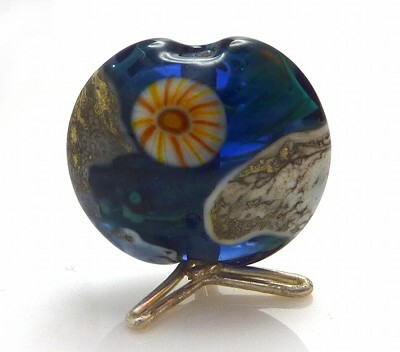 There were then trails of 3 dots in cobalt or lime green decorating other places on the bead. Then I encased the whole thing in clear, which in hindsight was probably a bad idea. The eye itself looks ok, though more smeary than it originally was, but the rest is rather lost. The encasing isn’t great either – I was getting tired and it was taking forever to melt smooth. The slightly irregular shape feels quite nice to hold, though.